Our exciting series on the history of cars continues! In our last chapter, we learned about the amazing Newcomen atmospheric engine. 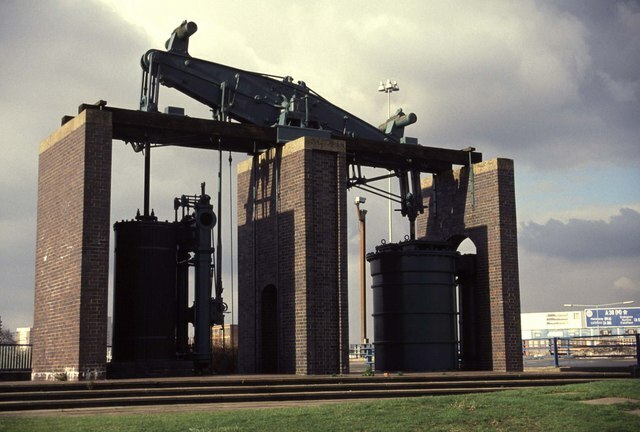 The Newcomen engine was very successful, and engines were installed all over England. These engines, however, were expensive to run and worked relatively slowly, at about 12 strokes a minute. Newcomen’s engines were therefore quite limited in what they could be used for, and were used mainly for pumping water out of mines. 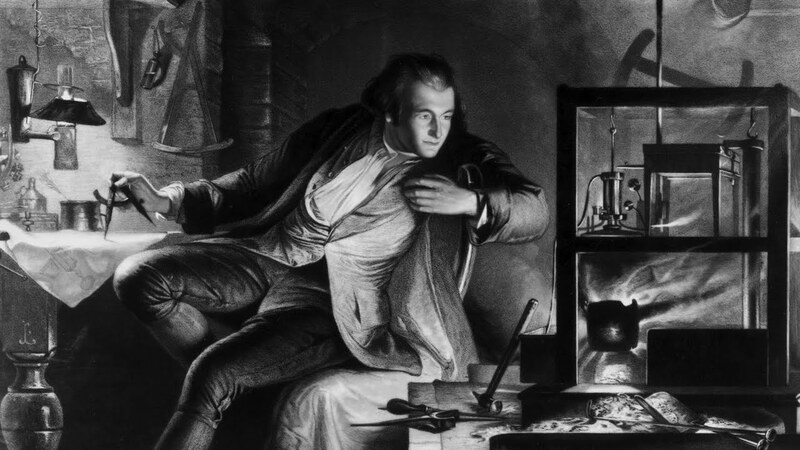 It was James Watt who came up with a way to vastly improve the efficiency of the atmospheric engine, and opened the way to the industrial revolution. James Watt studying a steam engine model. James Watt, born in Scotland, was a self-educated mechanical engineer. From his childhood, he was fascinated by mechanical instruments. Because of ill-health, he did not attend school much, but spent his time tinkering with tools, solving geometric problems, and reading. He became well known for his talents in mechanics, and was employed by the University of Glasgow as an instrument maker. In 1763, Watt was given a model of the Newcomen engine to repair. After examining it, he realized that it was very inefficient. The problem was the cylinder. Like we saw previously, the engine worked by filling a cylinder with steam and then condensing it by spraying cold water into the cylinder. What Watt realized was how much heat was being wasted. First, enough water was heated to fill the cylinder with steam. Then, cold water had to be sprayed into the cylinder to cool that steam, which also cooled the metal cylinder itself in the process. The process then had to be started again. So, for every cycle, the cylinder was reheated and cooled, reheated and cooled, over and over! Watt estimated that altogether three fourths of the heat went to waste. Watt eventually came up with an ingenious solution to this problem. He figured out that in order to keep the cylinder hot and still be able to condense the steam on each stroke a separate condenser was needed. This condenser would be kept perpetually cold, and the cylinder would always be hot. This solved the problem of wasted steam. A diagram of Watt’s engine. The condenser (H) can be seen under the cylinder (J). In principle, Watt’s engine worked in almost the same way as Newcomen’s. The piston was still pulled down with atmospheric pressure. However, the vacuum was created by letting steam into the condenser, instead of cooling it in the cylinder itself. Another important difference was that steam was also let into the top of the cylinder to help push the piston down, giving it more power. These improvements more than doubled the engine’s efficiency by saving so much steam and increasing the speed. A Boulton & Watt steam engine dating from 1817. 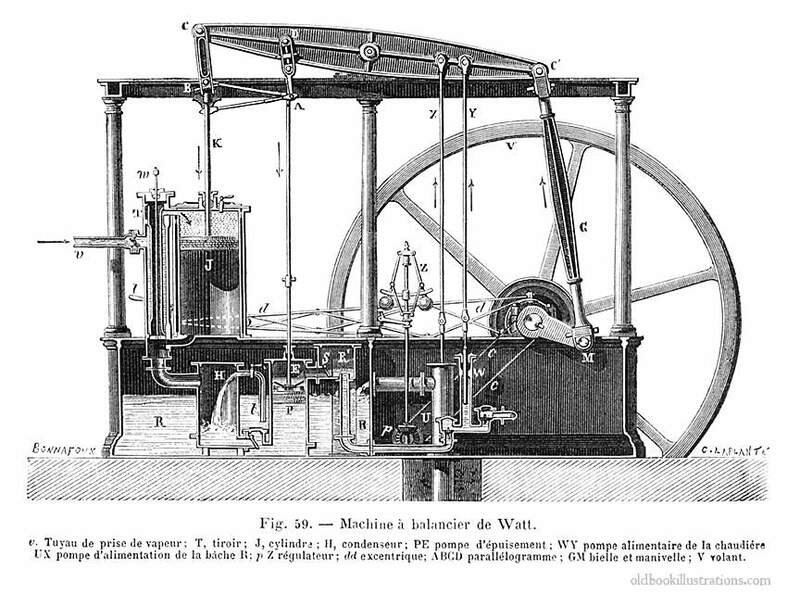 Together with other improvements, Watt’s engine was so successful and versatile, it is credited with being the start of the industrial revolution. Watt went on to achieve worldwide fame, and the unit of electrical power, the watt, is named in his honor.